I had my first three children when I was in my 20's. I was then not a plus size, as I am now. My older three kids are now 23, 26 (and a new mommy herself! ), and 29. Cut to 14 years later. New husband and a totally different life. I was 39 and Victor was 50 when we married. We were told we'd never have kids together, because we were "too old". I was also by now about 179 lbs. (at 5' tall). My weight was never mentioned, but we were definitely told we wouldn't have kids ("beating a dead horse" was the phrase used--that's a quote). Well, nine months and three weeks after the wedding, we gave birth about two weeks early, to our honeymoon baby, Bobby! When Bob was about three months old, the "impossible" happened again, and when Bob was 13 months old, along came his brother Jimmy, right on his due date! Neither one of these pregnancies was complicated by any of the issues supposedly caused by being a larger than average mom, BTW. I felt the only complications were caused by the deliveries being medically interfered with (too long to get into now). I told my husband that if we got pregnant again, I didn't want to go to the hospital. I had had a homebirth with my daughter, and a birth center birth with one son (baby #3), and I knew how much better it was to be in an environment where I was in control, not a bunch of stranger with needles, monitors, and forceps! Sadly, when I did get pregnant again, in 2002 and 2005, these pregnancies ended in miscarriage. But I trusted my body, and knew the losses weren't anything to do with my age, weight, or any medical conditions I wasn't aware I had. My new OB was actually really nice. He told me I was his "oldest naturally conceiving OB patient ever", and we both cracked up laughing! He never ONCE mentioned weight, and age was mentioned in passing, because he had to do it--not because he thought we'd want any invasive tests or anything. He knew better, because he knew we'd adopted three girls with Down's, and that was a non-issue. At 10 weeks, I panicked and thought something was wrong with the baby. He saw me immediately, got the baby's heartbeat instantly, and I clung to him and sobbed hysterically. At about 14 weeks, I saw on the ultrasound that the baby was moving--she was alive! I cried again. At 18 weeks, I went for my level 2 ultrasound. Ten fingers, ten toes, everything in the right place--and it was a GIRL!!!! Just what I wanted!!! Then came decision time. I knew that as much as I liked my doctor, I simply could NOT go back to that hospital. I wanted to be HOME. Nothing else would do. I expected a HUGE fight from my husband (otherwise known as "Mr.Traditional")--but the fight never came! He never said a WORD! I found a midwife (who never ONCE mentioned age or weight). Much later, after the baby was born, I mentioned this, and she said the same thing I had thought--she trusted the process. If I could get pregnant, I could give birth. It was just that simple in her mind--and mine--and we were right. I saw this midwife for the last few months of my pregnancy. I felt so nurtured, and so at ease! I prepared my kids for what might happen, as best I could (a great picture book about a homebirth, "Welcome, With Love", was a real help!). My biggest problem came late in pregnancy. I had a common pregnancy problem called Symphasis Pubis Dysfunction. It's something to do with the pubic bone separating, I believe, and it can happen to anyone. I didn't even know what it was until recently, actually. All I knew at the time was that I had a LOT of pubic pain, and had a hard time walking and doing a lot of other things. It was truly debilitating, but not age or weight related. On the evening of October 16, I began having strong contractions about 20-30 minutes apart. All through the night, I stayed awake and relished the feeling of peace I had. I wandered through the house (it was so QUIET--a minor miracle in a house with seven kids! ), made something to eat, made sure everything was in place, and took periodic long soaks in our jacuzzi. I lit candles, looked at myself in the mirror on the jacuzzi room wall, rubbed my belly, and smiled. I felt WONDERFUL. First thing in the morning, I called my midwife and told her it was no rush but that was the day. All through the morning, my contractions were strong, but not painful. The midwife came with her mom (who rubbed my back, made soup and jello, and knew emergency procedures in case we needed them) and her assistant (who took pictures and recorded things in writing as labor progressed). What a wonderful support team I had around me! The kids came in and out occasionally, but didn't stay. I kind of needed my space from them as I concentrated on delivery. My husband delivered ice packs and rubbed my back as the baby turned face up and I had back labor for a while. Since the baby was turned face up as she came down, the midwife gave me some homeopathics, and supported my belly with a bedsheet for a few contractions, and she turned face down again. What a difference from how the hospital would have handled that! My husband went to get our son from work, to help with the kids. I stayed in the jacuzzi, enjoying having warm water poured on my back. I had said I wasn't going to have a water birth, but the baby was coming so quickly, and I was so comfortable in the water, that I just stayed, even when I felt I had to push! The midwife's assistant ran to get my husband, who was downstairs in his office, and MY HERO (who never, ever wanted to actually see the birth!) jumped in the water behind me and held me as, in three pushes and less than five minutes, Abigail Michelle entered the world! Abby was 6 lbs., 12ozs., beautiful and healthy. And mom felt AWESOME. Talk about an empowering experience--that was IT. To this day, I can still feel the power I felt at that moment! Abby is now nine months old, has four teeth, weighs over 20 lbs., and is still nursing. She's strong-willed, and a real mama's girl. I have been so, so blessed! I'm not expecting any "little surprises" for my 50th birthday (coming up in January! ), but if I did get one, I'd hope for things to go exactly as they did this time. I'd do it all over again in a MINUTE. If anyone tries to tell you you can't have a baby because you're too old or too fat, or tries to scare you with everything that can go wrong--listen to your heart! Remember that I told you it IS possible to carry a baby to term, give birth joyfully and naturally, and have a beautiful, healthy baby, at any age or size! I know that for a fact, because I did it! Wishing you all beautiful pregnancies and births. I am Melissa Anne Carter mom to 4 children and currently pregnant, blessed at 40.9 months of age. My 2 older children from a previous marriage are Dylan, boy, 13 yrs and Zoe, girl, 11 yrs. My fraternal twin boys came as a complete shock at 38.5 years. The twins are 26 months old, 6 weeks prem. One of the twins suffered a preventable birth injury due to a doctor’s mistake as I developed Obstetric Cholestasis. Christian is brain injured, uses a gtube for 100% nutrition and a walker and wheelchair, cannot sit or stand independently and is the light of my life. Lleyton his baby brother by 1 minute is developing typically. After many exhausting months of life support - hospitalisation, doctors and more medical intervention I decided to try for a sibling with the hope of collecting cord blood for a stem cell transplant. My partner and I found out that my FSH level is 14 and that I would not be able to conceive again. As I have told I was not a candidate for IVF and that donor eggs were my only hope for success. I grieved, was shocked and decided to move on with my life, knowing my Creator had other plans. There are no donor egg programs in Canada and I did not have anyone that I felt I could count on. That was October I was told that great news :-(. The infertility specialist told me I was in menopause – LOL. So I waited for my cycle and it never came. 1 week after it was expected I took an HPT it was positive. I could not believe I became pregnant. We all were in shock. This happened all naturally as with the twins. Anyhow I just wanted to share my experience and hope. One day at a time, I am blessed, I know not what the outcome will be, but I do feel very blessed at having a second chance. I wanted to thank you for a wonderful site that helped me very much at the begining of my last surprise pregnancy at the age of 46. After reading the information and testimonials, I started believing in the possibility of me giving life to a healthy child, regardless of my age. In July, 2005, close to my 47th birthday, I gave birth to the perfectly healthy and absolutely beautiful baby boy. With my wonderful birth experience, I would like to encourage other women who happen to get the positive pregnancy test late in their forties. I came across your website when I was expecting my 8th child, at the beginning of my pregnancy in early 2006. At the time, I was 46 years old, and worried about losing my baby, or it maybe being born with a serious handicap. Mostly, one is confronted with a lot of negative information about late pregnancy, and reading the positive birth reports on your website really boosted my confidence! I had suffered 4 miscarriages between 2001-2005, and had actually given up the idea of having one last baby, thinking I was probably just "too old". 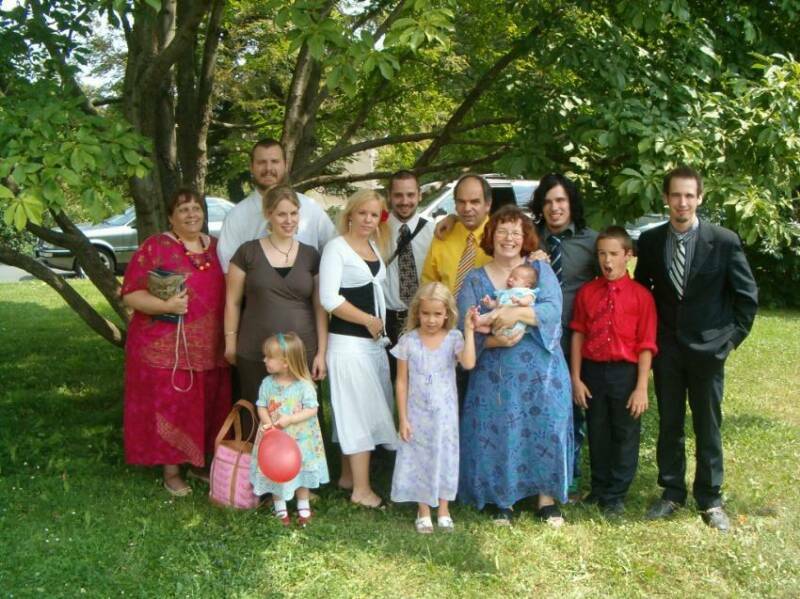 My husband (52) and I already had seven other children (26, 24, 22, 20, 17, 12, & 8 years). However, in October 2005, a pregnancy test turned out positive, much to my surprise. I was overjoyed, but also VERY fearful of losing the baby again, as I had the past 4. After having passed the first few weeks without any trouble, I was confronted with the advice of my gynecologist to have an amniocentesis done. I only gave it short consideration, and it was quickly clear to me that I would never be able to get over losing a baby because of something going wrong during this examination. I also realised that I would certainly not want to have an abortion, should the test results turn out badly. So, I declined. I did agree to a thorough ultrasound screening in the 22. week, though. The more time that passed, the more confident I felt that everything would be alright. The thought of maybe having a handicapped child also didn't scare me anymore, for I felt that I could love and accept this child, no matter what. On June 28, 2006, at the age of 46 1/2, I gave birth by c-section to a healthy baby girl. She is a great blessing to our family, and we are so grateful for her! Our daughter, 26, gave birth to our second granddaughter 4 months later, and it is so much fun to see the two babies growing up together! We began trying to conceive our second child just before I turned 40. Prior to that I was completely content with our only daughter and light of our lives. However as I saw 40 looming I came to realize that I really wanted just one more baby to complete our family. Thankfully, my husband agreed. I wasn't particularly concerned about my chances of conceiving until I started having miscarriages. In fact I had three consecutive miscarriages, and my husband is ten years older than me. If you should Google that, as I did, I promise you'll find a lot of gloom and doom! Don't believe everything you read. I dabbled in fertility treatments (a few cycles on Clomid, a couple attempts at IUI) but never conceived during that time. However, prayer and God's mercy resulted in the birth of our beautiful daughter last August. For those of you still trying I hope this encourages you. Our baby is 13 months old today; our family is happy and complete.